Pictured, from left to right, after accepting the WTA award: Roger Bijos, Sales & Marketing Director, and Steven Soenens, Product Marketing Director, Skyline Communications. [Satnews] Skyline Communications, a global leader in end-to-end multi-vendor network management and OSS software solutions for the broadcast, satellite, cable, telco and mobile industries, has announced that their cutting-edge, nexgen network management platform—DataMiner—was awarded the World Teleport Association's (WTA) Teleport Technology of the year award for 2016. Satnews Publisher Silvano Payne was on hand at the awards and captured the moment with a photo of not only the Skyline Communications executives who received the WTA award, but also of the award itself. 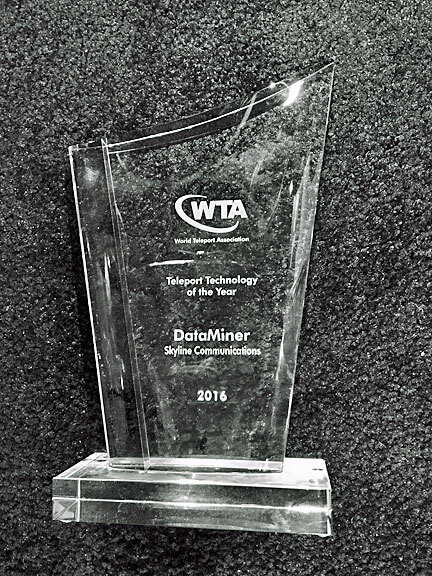 The WTA Award given to Skyline Communications for the 2016 Teleport Technology of the Year, DataMiner. DataMiner provides broadcasters, satellite operators, and cable, telco and mobile service providers with an unprecedented end-to-end visibility and control over their entire network and operations, across any possible vendor and technology boundaries. 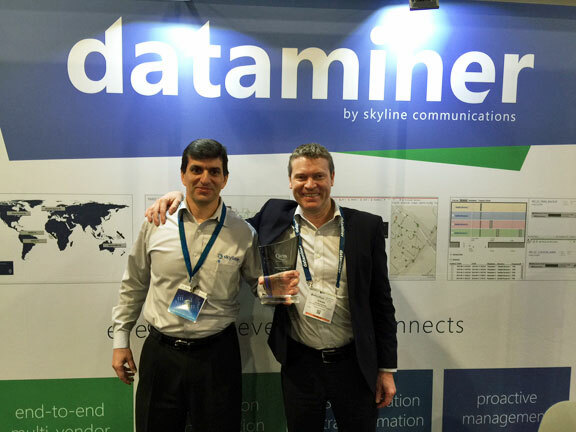 As a result of continued far-reaching innovation by the highly skilled team of Skyline Communications, DataMiner has already been selected by more than 650 customers in over 100 countries around the world, to manage some of the most prestigious infrastructures more efficiently and more intuitively than ever before, and the award-winning platform keeps on gaining momentum as the undisputed leader in NMS & OSS technology. The winners of the award were announced at the 21st annual Teleport Awards for Excellence Ceremony and Luncheon on March 8 during the SATELLITE conference at the Gaylord National Convention Center in National Harbor, Maryland.